Poor colour vision is when a person has a reduced ability to distinguish between certain colours. This is usually inherited and men are more likely to be born with poor colour vision. People with poor colour vision cannot distinguish between certain shades of green and red and less commonly between shades of blue and yellow. • Diseases - Diseases such as diabetes, glaucoma, Alzheimer's disease, Parkinson's disease, chronic alcoholism, macular degeneration, leukemia and sickle cell anemia can cause colour deficits. • Inherited disorder - One can inherit a mild, moderate or severe degree of the disorder. The inherited poor colour vision usually affects both eyes and the severity doesn't change over one's lifetime. • Aging - A person's ability to see colours deteriorates slowly as he or she grows older. • Medications - Certain medications that are used to treat heart problems, high blood pressure, infections, psychological problems, erectile dysfunction and nervous disorders can alter colour vision. 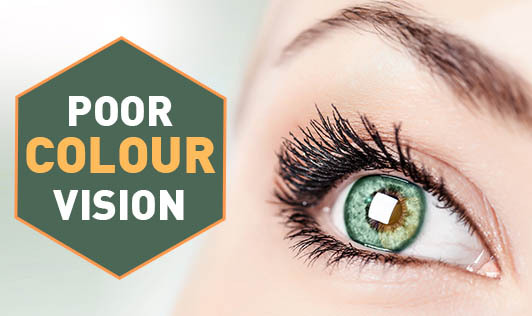 • Chemicals - Being exposed to chemicals such as carbon disulfide and fertilizers may cause loss of colour vision. A colour vision problem can have a big impact on a person's life and hence, it is important to detect the problem as early as possible!